If you have a gun which takes a refillable bottle then with this adapter you can use our disposable 88g cartridges. Adapter only - cartridge must be purchased separately. Make sure it is tightly screwed into your gun! Warning - If 88g Cartridge is attached do not unscrew before checking 88g Cartridge is empty!! The adapters are 37mm long and 19mm once the adapter has been screwed into place. Dia 23mm (at widest point). Female thread fits M16 x 1.5. Male thread 1/2 inch x 14 BSP. 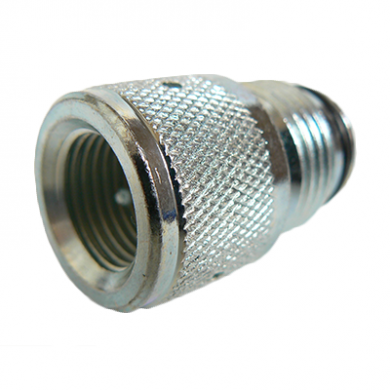 Sorry - We are out of stock of 88g Adapter - Required to use 88g with most paintball guns..